like the lungs, liver and pancreas. The Wnt/β-catenin signaling pathway and microRNA 335 have a key role in helpingdifferentiated progenitor cells form from stem cells. These progenitors are organized in germ layers and are thus the origin of different types of tissue, including the pancreas and its insulin-producing beta cells. With these findings, Helmholtz Zentrum München scientists have discovered key molecular functions of stem cell differentiation which could be used for beta cell replacement therapy in diabetes. The results of their two studies appear in the journal Development. The findings of the researchers at the Institute of Diabetes and Regeneration Research (IDR) at Helmholtz Zentrum München (HMGU) provide new insights into the molecular regulation of stem cell differentiation. Their findings reveal important target structures for regenerative therapy approaches to chronic diseases such as diabetes. 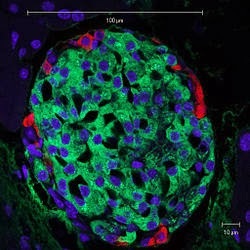 During embryonic development, organ-specific cell types are formed from pluripotent stem cells, which can differentiate into all cell types of the human body. The pluripotent cells of the embryo organize themselves at an early stage in germ layers: the endoderm, mesoderm and ectoderm. From these three cell populations different functional tissue cells arise, such as skin cells, muscle cells, and specific organ cells. Various signaling pathways are important for this germ layer organization, including the Wnt/β-catenin signaling pathway. The cells of the pancreas, such as the beta cells, originate from the endoderm, the germ layer from which the gastrointestinal tract, the liver and the lungs also arise. Professor Heiko Lickert, director of the IDR, in collaboration with Professor Gunnar Schotta of LMU München, showed that the Wnt/β-catenin signaling pathway regulates Sox17, which in turn regulates molecular programs that assign pluripotent cells to the endoderm, thus inducing an initial differentiation of the stem cells. 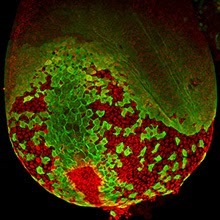 Photo showing a mouse pancreatic islet as seen by light microscopy. Beta cells can be recognised by the green insulin staining. Glucagon is labelled in red and the nuclei in blue. In another project Professor Lickert and his colleague Professor Fabian Theis, director of the Institute of Computational Biology (ICB) at Helmholtz Zentrum München, discovered an additional mechanism that influences the progenitor cells. miRNA-335, a messenger nucleic acid, regulates the endodermal transcription factors Sox17 and Foxa2 and is essential for the differentiation of cells within this germ layer and their demarcation from the adjacent mesoderm. The concentrations of the transcription factors determine here whether these cells develop into lung, liver or pancreas cells. To achieve these results, the scientists combined their expertise in experimental research with mathematical modeling. "Our findings represent two key processes of stem cell differentiation. 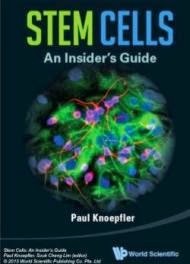 With an improved understanding of cell formation we can succeed in generating functional specialized cells from stem cells. These could be used for a variety of therapeutic approaches. In diabetes, we may be able to replace the defective beta cells, but regenerative medicine also offers new therapeutic options for other organ defects and diseases." said Lickert. Diabetes is characterized by a dysfunction of the insulin-producing beta cells of the pancreas. Regenerative treatment approaches aim to renew or replace these cells. An EU-funded research project ('HumEn'), in which Lickert and his team are participating, shall provide further insights in the field of beta-cell replacement therapy. The aim of research at Helmholtz Zentrum München, a partner in the German Center for Diabetes Research (DZD), is to develop new approaches for the diagnosis, treatment and prevention of major common diseases such as diabetes mellitus.